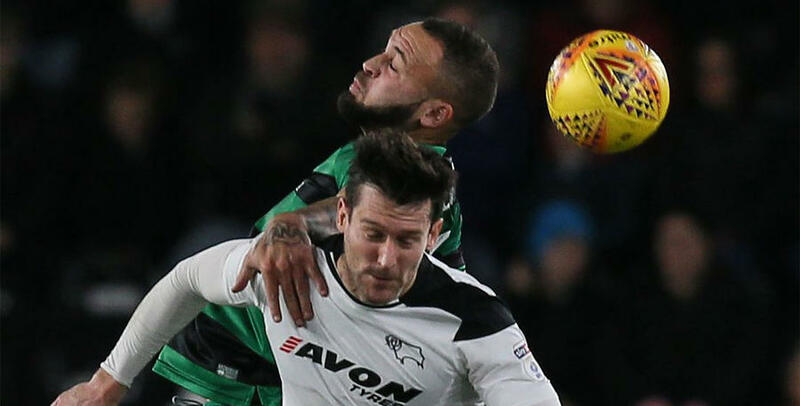 QPR went down 2-0 at Derby County with goals from Matej Vydra and Tom Lawrence either side of the break doing the damage at Pride Park. After a first-half of few clear-cut chances, the R’s looked to be heading in at the interval satisfied with their showing in the opening 45 minutes, but in injury time the hosts struck through Vydra as Gary Rowett’s men punished the R’s on the counter-attack. After the break, the Rams increased their lead with the first real chance of the second half for either side, with Lawrence slamming home from the edge of the area with a fine strike. In truth, it was a disappointing performance from QPR who struggled to get themselves back into the game after Vydra had broken the deadlock. Holloway made three changes from the side that lost narrowly against Aston Villa at the weekend, and in doing so opted for a different formation for the trip to Pride Park. Mass Luongo (illness), Jordan Cousins (knee) and Matt Smith (on the bench) all missed out, with Yeni Ngbakoto, Pawel Wszolek and David Wheeler coming in. The R’s lined up in a 5-4-1 formation, with Wheeler leading from the front. Alex Smithies continued between the sticks behind a back five of Jake Bidwell, Joel Lynch, Jack Robinson – who skippered the side in the absence of Nedum Onuoha and Luongo – Alex Baptiste and Pawel Wszolek. Bidwell and Wszolek were given licence to overlap down the flanks at every opportunity, while Ngbakoto and Mackie operated as wingers with Josh Scowen and Luke Freeman starting in the centre of the park. 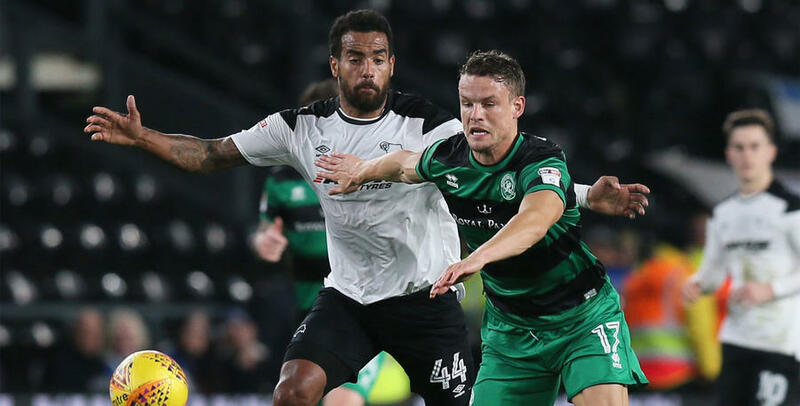 Meanwhile, Gary Rowett made once change from the side that drew 1-1 at Fulham on Saturday, with the injured Bradley Johnson replaced by Andreas Weimann. The hosts came into this fixture level on points with sixth-placed Middlesbrough and with a game in hand on the north-east outfit. But after picking up one point from their last two games – the draw at Craven Cottage followed a 4-2 reverse at home to Reading – Rowett will have been keen to see his men get back on track tonight. The R’s made a positive start and in the fifth minute created their first chance of the night when Scowen played a neat one-two with Wheeler before seeing his shot from 18 yards blocked. Just before the 20-minute mark, the Rams got their first real sight of goal but Weimann’s effort was well over following a goalmouth scramble. Despite operating with a lone striker, QPR’s high-pressing style was still very evident. That approach nearly brought the first goal of the night when Mackie won possession off Curtis Davies before crossing for Ngbakoto, but the DR Congo international couldn’t get his head to the delivery before it was cleared into the path of Freeman, who saw his effort fizz just over from 20 yards. On 25 minutes Scowen released Wszolek down the right, and the R’s winger cut inside Davies well but saw his delivery float over the crossbar. There were few clear-cut chances in the first half, but in injury time the hosts took the lead with their first real opportunity. From a QPR attack, the Rams broke down the right through Weimann and he raced to the byline before pulling the ball back into the path of Matej Vydra who diverted home from close range. It was the final action of the first half and was harsh on the visitors who had dealt so convincingly with Derby’s attacking threat. At the break, Holloway brought on Ryan Manning at the expense of Lynch. The Irishman played as a left wingback, with Bidwell shuffling into the centre of defence to partner Robinson and Baptiste. But on 53 minutes the hosts had doubled their lead, this time through Lawrence’s vicious drive from the edge of the area after Vydra had initially got in behind the R’s backline. It was a huge blow for the R’s, and Holloway reacted by making his second chance of the evening with Washington coming on for Ngbakoto. David Nugent had a great chance to make it 3-0 when he broke down the left but his effort was excellently saved by Smithies, and the R’s stopper was then alert to smother the rebound. Holloway made his final substitution on 64 minutes with Smith coming on for Wheeler, and switched to a 4-4-2 setup. Mackie saw his header from a Freeman corner loop just over the crossbar after Washington had flicked on at the near post in the 69th minute, and while the game seemed to be disappearing from the R’s there was always the chance that the next goal could really turn the match. And it was almost the hosts who grabbed it in the 71st minute, but Smithies saved well to deny Lawrence before Weimann’s follow-up bounced just wide of the upright. Substitute Chris Martin nearly added a third but he too was denied by Smithies with the R’s keeper smothering at the near post. In injury time Freeman forced a save from Scott Carson with a low drive from the right. As the game drew to its conclusion, Rangers were left licking their wounds but they will be keen to get themselves back on track when they host Brentford at Loftus Road on Monday night. WATCH highlights from QPR's 2-0 defeat against Derby County at Pride Park.